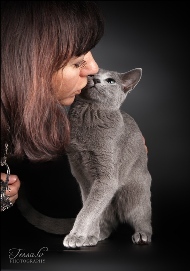 Affectionate but not pesky Russian Blue is rather outstanding among all other felines. It will make a loving friend and a helper in all your joys and sorrows. It will never annoy you but will always come to rescue you from your loneliness. 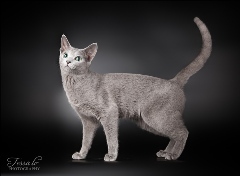 Russian Blues are elegantly shaped and possess a truly aristocratic appearance complimented by their excellent temperament and training abilities. These cats are known for their strife for independency and do not stand any violence. They are very intelligent and have a quiet but beautiful voice. They always know exactly when you need them and come to comfort you with their purr. They are quite the type of cats who will never show their claws while playing with you so it’s unlikely that you will ever suffer from their scratches. Their most distinguished trait is their easy nature. They show their tenderness by rubbing their backs against your legs and their gentle purr will indicate they wish for a bit of cuddle in your arms. Being treated as truly friends, they are ideal for living indoors and do not seek any breakout outside the walls of your house. Russian Blues are extremely pleasant to touch and pat. They have silvery blue plush silky coat, which is short and thick, so you want to stroke them for hours. When you touch a Russian Blue, there is always a feeling of some blissful comfort, which makes you forget troubles of the day. You may sit with a Russian Blue in your arms all day long and never get tired of it. Russian Blues are especially demanding about hygiene. They will never drink stale water or eat from a filthy bowl. They are just like us, humans. We all have meals from clean plates, so likewise this shouldn’t be much effort to wash their bowls before offering them their food. Everyday Russians repeat their cleaning rituals an infinite number of times. They are perfect animals in terms of any smells or hair-strewn sofas. When they shed, these cats cause little trouble connected with house cleaning. Owing to their short coat, there is no need in any special grooming. All you have to do is to comb them once a week with a soft brush, bathing is not required. But you must remember to pat their fur with clean dry hands and to avoid using hand cream or lotion before doing so. Training them to toilet is easy but make sure you clean their litter box every day. This shouldn’t be a problem for any Russian Blue owner, for having unpleasant smells in your home is much more troublesome than getting rid of them before they spoil the air all around you. Once trained to their litter box, Russians will never turn away from it. Owing to their northern Russian origin, Russian Blues possess very good health and stamina and are psychologically leveled. They are great hunters, so whatever flies or crawls in your house are bound to be inevitably caught by them. They love playing around and will always involve their owners in their games. Russian Blues are excellent jumpers. They are very quick at targeting and pounce at their toys with much ease and grace. Russian Blues can quickly adapt to your home lifestyle and make a good member of your family. They are intelligent, well-behaved, and very affectionate to every member of the family. However, they become love-obsessed about only one person in the family who they choose as their sole master and who they will trust entirely. They can establish good rapport with children and get on fairly well with other cats. Russian Blue cats are even capable of making any dog respectful of their rights. They are superior charmers and are exceptionally great companions. At the same time, these cats never feel lonely or depressed when their owners leave them on their own for a long time, for they can easily get themselves busy with their feline business. Russian Blues have a great appreciation of comfort in your home and are rather communicative. Their astounding intellect, good temper, and unobtrusive way of socializing are quite the things that make these cats so adorable and charming. For people who have once ventured into having a Russian Blue as a pet, it will be impossible to imagine their lives without that animal. There is a popular belief that Russian Blues bring happiness and wellbeing into your home. 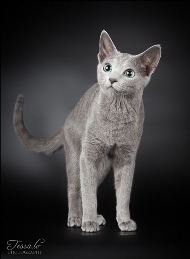 Russian Blues are naturally bred cats which means they were not derived artificially and that is the reason for their strong immunity and good health. This breed is free of any innate diseases. Proper care will result in their long living. In nourishment, if professional premium class dry food is used, no extra additives or vitamins are needed in their diet, as long as they are already included in the product by a manufacturer. Certainly, any owner may invent their own diet scheme for their pets depending on the type of food the cat’s parents had. If all these conditions are properly observed, your furry friend will be saved from abnormal shedding, his/her eyes and ears will be always clean and discharge-free. You may also treat your cat with something extra delicious - in the morning before your leave for work and in the evening when you come back - by introducing cats’ tinned food into his/her diet.